Sometimes I get caught up in the whirlwind of the very selective and fake "Instagram perfection" and I literally wear myself out. Truth is, I don't want to be made up everyday. Don't get me wrong, I like wearing makeup, doing my hair, and dressing up for myself. But I usually have some makeup-free, messy bun days in between. "Spring" is in full force (and by spring I mean 90-degree heat) so I've been pulling out all my cotton dresses and putting my hair up to stay cool and comfortable. I guess you can say this is my in-between kind of everyday look. I definitely feel fabulous but I'm ready for whatever these almost-triple-digit days have in store for me! 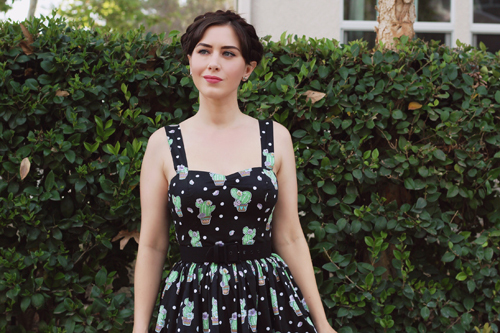 This cactus print dress from Top Vintage is great for these warmer months. It's a super light cotton fabric and features adjustable straps, sweetheart neckline, elastic side panels on the bodice (hello taco room! ), full gathered skirt with hidden side pockets, and a back zippered closure. Thanks to those stretchy side panels, I took a size XS and it was a good fit, maybe even a little on the roomy side. I paired this dress with my new leather clogs and I am in love! These shoes are super comfortable and stylish. I took my usual size 40 and it was perfect. Definitely runs true to size. They also come in red, yellow, and green and I feel like I need them all! This weekend is gonna be crazy because I'll be vending at the LA Shag Festival this weekend! My super stylish friends and I rented a booth and we'll be selling true vintage, repro, and retro clothing, shoes, accessories, and more! Almost everything is $60 and under (we will have a very select few "fancy" items that cost a bit more) and we'll have sizes ranging from XS-2X. The event is being held at the Burbank Marriott and the vendor room is open to the public... No tickets needed! You can find all the information on the event HERE. I'd love to see you there!